Retaliatory threats and attacks follow terrorist couple’s murder spree, encouraged by bigoted remarks from politicians and pundits. The murderous rampage by two apparently radicalized Muslims in San Bernardino, Calif., on Dec. 2 has become the latest flashpoint in the massive bonfire of Islamophobia being whipped up by anti-Muslim extremists and their mainstream conservative enablers in the United States. In St. Louis, Mo., a man phoned in a threat to the local offices of the Council on American-Islamic Relations, vowing to kill any Muslims who dared show up on his property. That man is unlikely to be charged with any crime. In Palm Beach, Fla., a lone vandal attacked a local Islamic center, breaking windows and wreaking property damage inside. The man who was later arrested for the crime is the son of a well-known local educator. In Grand Forks, N.D., someone scrawled graffiti featuring a Nazi symbol and the words “Go home” on the walls of a Somali restaurant owned by a Muslim family. Two nights later, someone deliberately set an arson fire at the restaurant, causing an estimated $90,000 in damage. In Twin Falls, Idaho, someone spray-painted boards that covered the windows of the local Islamic center with the words “Hunt Camp ?” The graffiti referred to the old Minidoka Relocation Center in nearby Hunt, the site of the massive Japanese American internment erected during World War II, apparently suggesting the same fate for Magic Valley Muslims. Local police were investigating the matter as a potential hate crime. 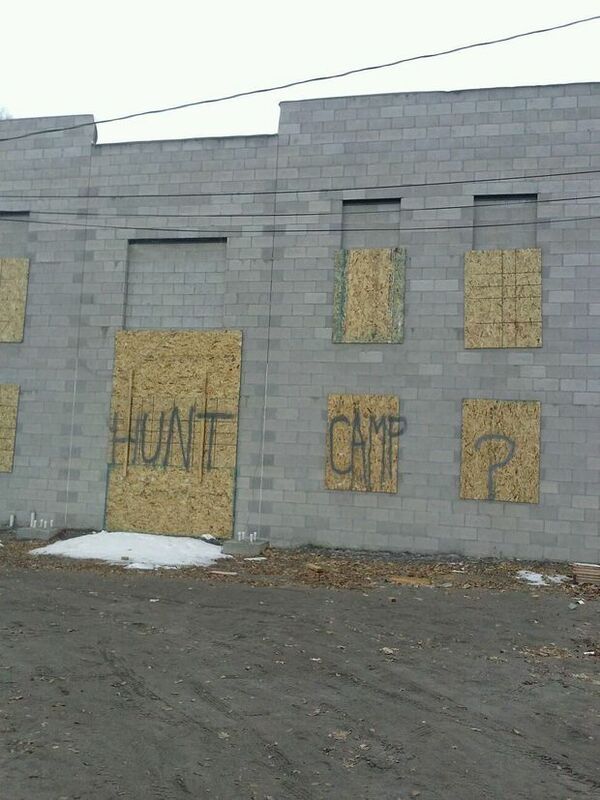 Vandals scrawled 'Hunt Camp?' on the windows the Twin Falls, ID, Islamic center, referring to a nearby internment camp for Japanese Americans during World War II. There has been a rash of other, mostly petty, ugliness as well: A sixth-grade Muslim schoolgirl in Brooklyn was attacked at the school – punched, her headscarf yanked, and called “ISIS” by classmates – but police declined to file a report in the matter. Two Muslim women were verbally assaulted by a fellow patron at an Austin, Texas, restaurant, and then told that “nobody” cared about them. A woman in Fort Worth, Texas, reported that an angry woman confronted her in her car, rolling down her window and shouting at her, before she spat on her. The Twin Falls case provides a stark example of how extremist anti-Muslim rhetoric trickles down to create permission for violence in local communities. The local refugee resettlement center has in recent months become the focus of a virulent campaign stoked by national groups designated as anti-Muslim extremist and hate groups by the SPLC, even attracting the high-volume participation of armed militiamen from the antigovernment “III Percent” movement. The spate of ugliness has wounded the Muslim community: “I think people are upset, people are humiliated,” observed Marwan Kreidie, director of the Arab American Development Corp., in an Associated Press interview following the incident with the pig’s head. “We’ve never had incidents like that – even after 9/11, we didn’t have anything like this. The bonfire became a massive conflagration in the wake of the Nov. 13 ISIS-based terrorist attacks in Paris that left 130 people dead and another 368 injured. A parade of mostly Republican governors promptly announced they intended to close their doors to Syrian refugees, even though that decision is not within their purview. And Muslims began seeing a marked increase in hate crimes and other attacks. After last Wednesday’s massacre, the issue blew up altogether, with a number of politicians and pundits lining up to declare that their fears about admitting Muslim refugees had been proven right. At the same time, the floodgates of ugly behavior toward Muslims appeared to open wide all across the country. The Republican candidates’ fearmongering, however, is only the culmination of a long-running campaign by extremist organizations to whip up fears about Muslims. A number of these groups – in particular, Frank Gaffney’s Center for Security Policy, whose misinformation was cited by Trump in his attempts to justify his call for a Muslim immigration ban – have been claiming for years that all Muslims are extremists in waiting. One of Gaffney’s acolytes, Ann Corcoran, has played a leading role in the effort to associate the refugee-resettlement programs with the ostensible threat of terrorism. In the meantime, Pentagon officials explained Tuesday that this kind of bigotry was playing directly into the hands of the terrorists, whose whole intention is to attempt to create bigoted attacks on Muslims in America and Europe so that those Muslims will have an incentive to become radicalized. “Anything that bolsters ISIL’s narrative and pits the United States against the Muslim faith is certainly not only contrary to our values but contrary to our national security,” Pentagon spokesman Peter Cook told a news briefing.